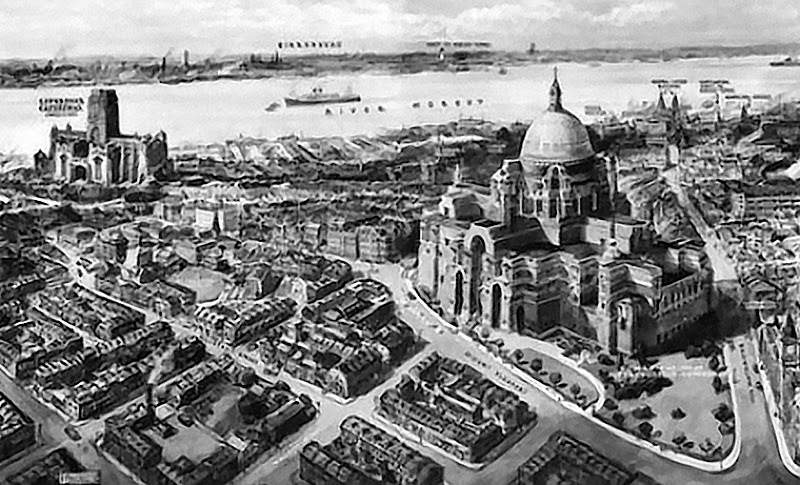 The cathedral, seat of the Roman Catholic Archdiocese of Liverpool, would have been a massive 530 ft long, larger than any other cathedral in England. The ceiling of the nave would reach 138 ft from the floor, while a great dome, 168 ft in diameter and 300 ft high would crown the church. 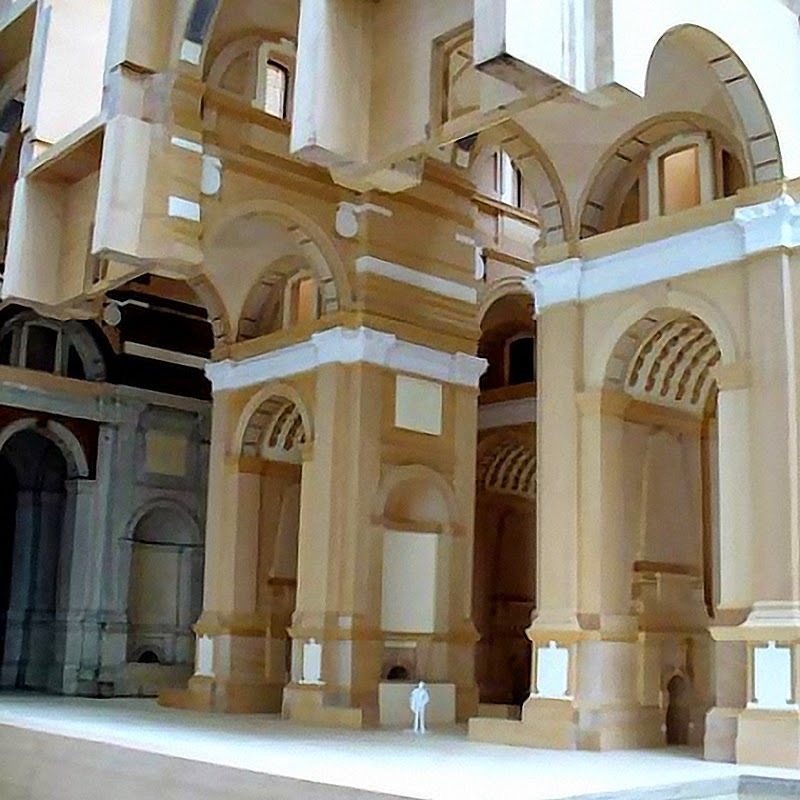 Aside from the high altar, which would be twelve feet above the floor of the nave, fifty-three side altars would be located down the nave, along the aisles, and in the transepts and apse. The cathedral's dome would have been larger than St. Peter's in Rome. At 520 ft, the cathedral's height would overpower the nearby Anglican cathedral, itself 330 ft tall. (Somewhat ironically, the design of Liverpool's Catholic cathedral was by Lutyens, an Anglican, while the modern gothic of the city's contemporary Anglican cathedral, was designed by Gilbert Scott, a Catholic. 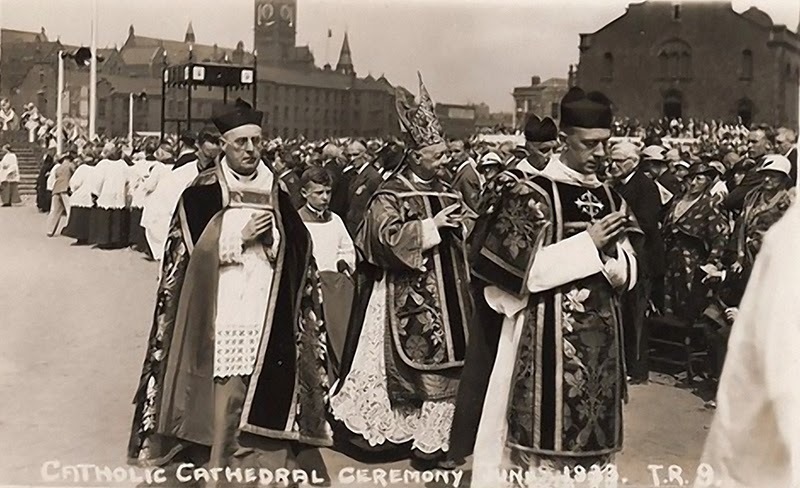 The foundation stone was laid on Whit Monday, June 5, 1933 and work continued even after the start of the Second World War, until 1941 when the growing restrictions of wartime finally meant that construction had to cease. In 1956 work recommenced on the crypt, which was finished in 1958. Thereafter, Lutyen's design for the cathedral was considered too expensive and so was abandoned. 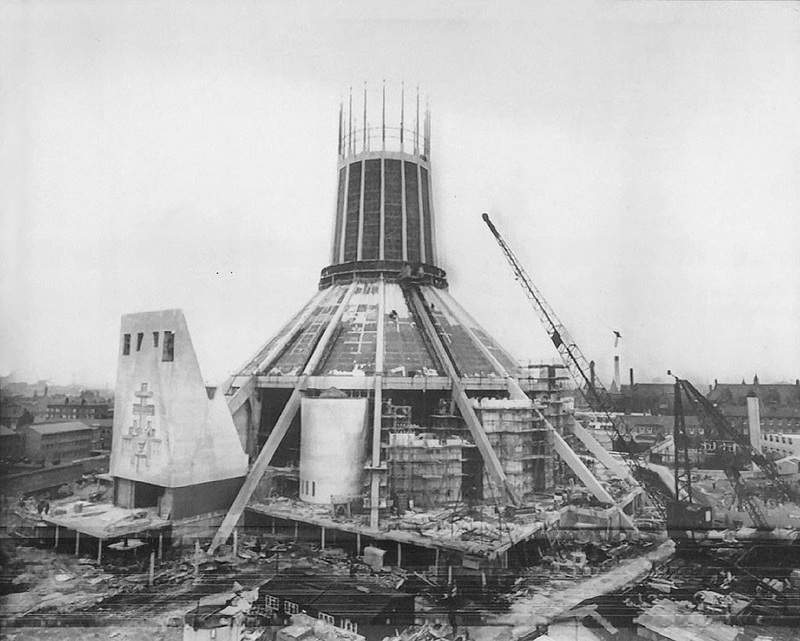 In 1960, 110 years after the formation of the Liverpool Catholic diocese, and still no cathedral in Britain's fourth largest city, a world wide competition was launched for the design of a third cathedral.This time the work was given to the design winner, English architect Fredrick Ernest Gibberd ( 1908 – 1984). 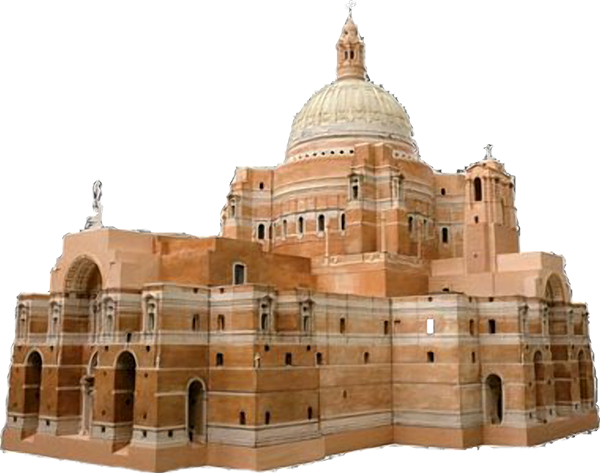 Frederick Gibberd’s original design incorporated the Crypt, designed by Lutyens, into the scheme by transforming the top of the crypt’s roof into an elevated piazza, but the design did not include a direct link between the crypt and the new cathedral. Frederick Gibberd's design was the winner out of 289 entries, the assessors concluding that it 'powerfully expresses the kingship of Christ, because the whole building is conceived as a crown'. Gibberd put a flat roof over Lutyens' crypt to make a space for outdoor services, and designed a new church with an underground car park on land to the south. The cathedral has a concrete frame with ceramic mosaic cladding; walls are clad in Portland stone whilst aluminium covers the roof. It is 16-sided, with a perfectly central alter under a glazed corona. Stained glass was designed by John Piper and Patrick Reyntiens, which is 25 millimetres thick and set in concrete panels. Elisabeth Frink designed the altar cross, R Y Goodden the candlesticks and the marble floor is by David Atkins. The stone belfry and bronze outer doors feature relief panels by William Mitchell, and the Chapel of the Blessed Sacrament has a mural by Ceri Richards. The Lady chapel has traditionally set glass by Margaret Trahearne, and a Madonna and Child by Robert Brumby. Building began on the new design in 1962 and it was opened in 1967. 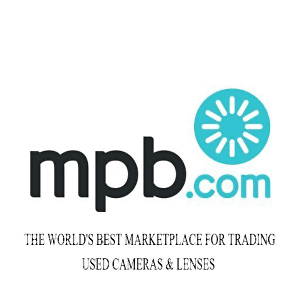 "The Metropolitan Cathedral of Christ the King is beautiful. The internal space filled with light and colour is a very powerful experience - a single and apparently simple space which represents an idea. The circular plan form of the Metropolitan Cathedral is the built embodiment of a change in the Catholic liturgy (the bringing together of the priests and the congregation around a central altar), and as such it is a rather rare and special example of a particular point in time for church architecture". And indeed it is a beautiful Cathedral, as we can see from some of the photographs below. The building was not without problems, looking remarkably like The Cathedral of Brasilia, a hyperboloid structure designed by Oscar Niemeyer in 1958, it soon started leaking like a giant colander. The architect Frederick Gibberd was sued, and structural problems were not resolved until the 1990s. Eventually, the mosaic tiles had to be replaced with glass-reinforced plastic. However, the building has stood the test of time and remains one of the great features of the city. Now loved by many who are proud to have two Cathedrals in the City, people now seem to have got used to it. So,why the 'Metropolitan' Cathedral of Christ the King? well, Liverpool is fortunate enough to possess two mighty symbols of the Christian faith in the two Cathedrals which face each other at opposite ends of the aptly-named Hope Street. Both are dedicated to Christ: the Anglican one to Christ and the Blessed Virgin and the Catholic one to Christ the King, so it helps avoid confusion to refer to one as Liverpool Cathedral and the other as The Metropolitan Cathedral. 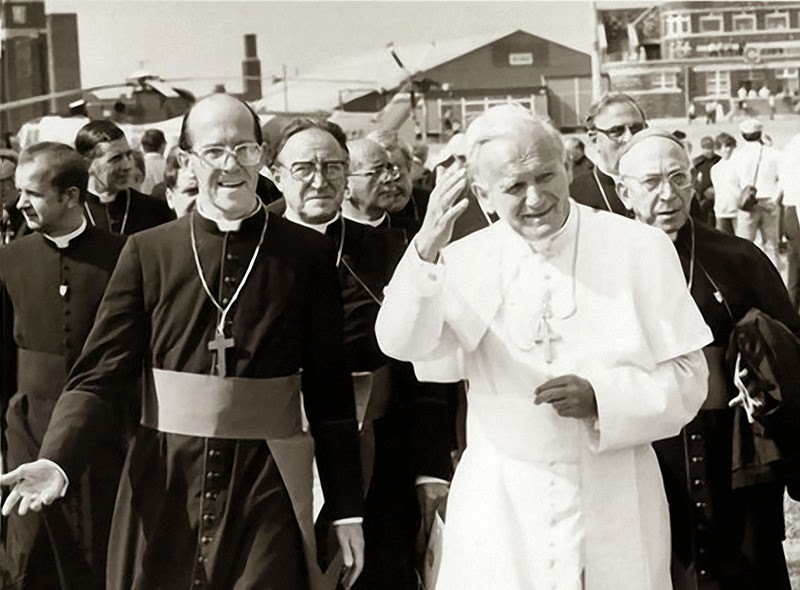 When Pope John Paul II visited Liverpool in 1982 more than a million people turned out to greet him, on Sunday, 30 May 1982, Pope John Paul II celebrated Mass at the Metropolitan Cathedral of Christ the King. The visit almost didn’t happen because of the Falkland’s War which was taking place at the time. Some nimble and delicate diplomacy by Archbishop Derek Worlock saved the visit which many thought would be cancelled. The Pope was greeted at Speke Airport by Lord Mayor Stanley Airey before making his way to the two cathedrals in a motorcade including the famous ‘Popemobile’. Security along the route was tight as only a year previously the Pope had survived an assassination attempt in St Peter’s Square by a Turkish nationalist Mehmet Ali Agca. The Pope travelled between the city’s two cathedrals. 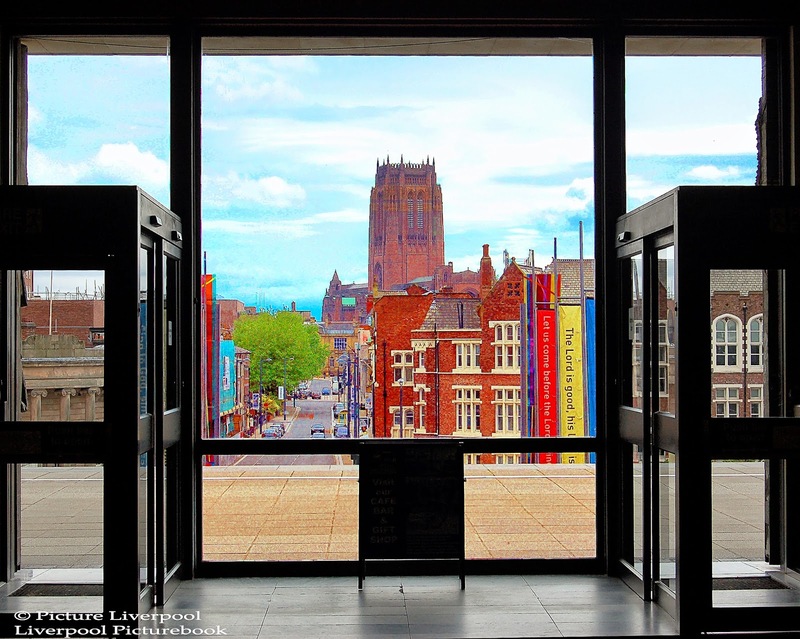 The entrance of the Pope into Liverpool’s Anglican Cathedral was even more symbolic in a city which had once been split by religious tensions which had now almost disappeared under the leadership of Archbishop Worlock and the Right Reverend David Sheppard the city’s Anglican bishop. 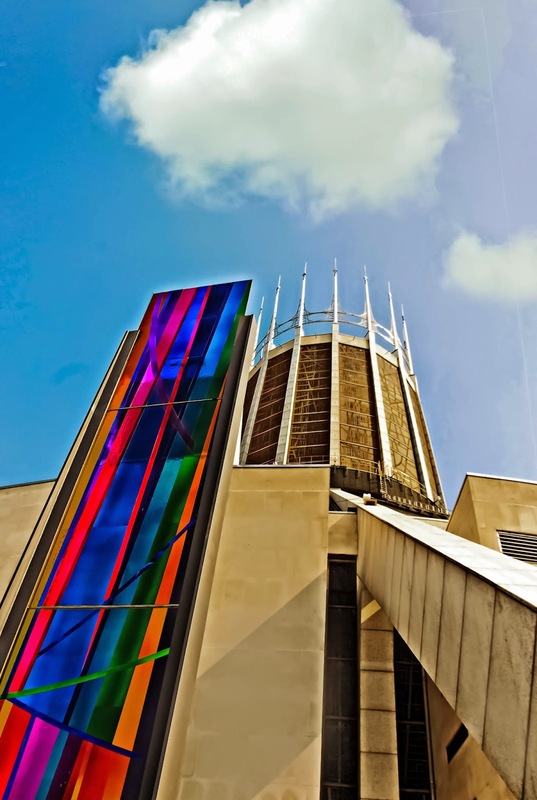 Improvements to the Cathedral continue to be made ,Nightingale Associates where appointed by the Archdiocese of Liverpool to design a pavilion which, for the first time, opened up the Metropolitan Cathedral of Christ the King’s Crypt to public access. This is the first addition to the building since its completion in 1967 and follows on from Nightingale Associates’ first involvement with the Cathedral in 1993 when a design team led by former Consultant Bing Vis started a ten year programme of renovation and repairs to the main fabric of the Cathedral. This £8 million pound programme of works included a complete re-roofing of the Cathedral, works to the Stained Glass lantern, a new external lighting scheme, major works to the podium and was finally completed in July 2003. The Cathedral is a fine building and its unique architecture makes it an outstanding feature in a city with many outstanding buildings. I think that this is one to be proud of. 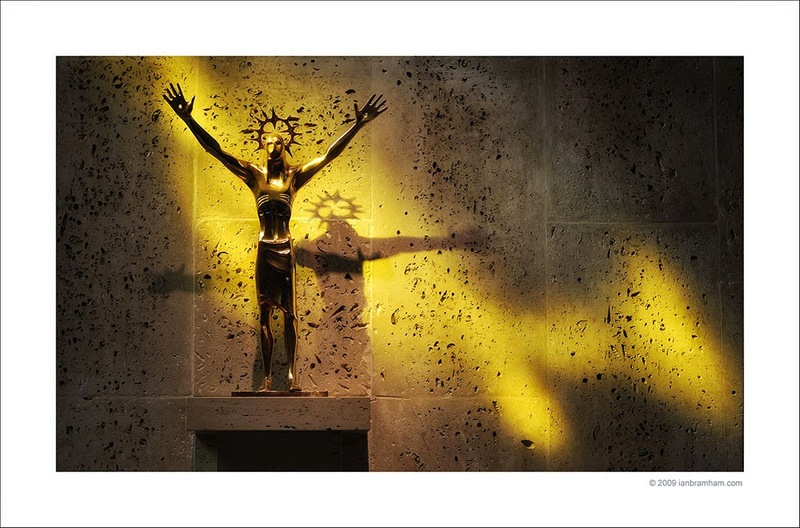 "This is a photo from a small side chapel in Liverpool's Metropolitan Cathedral and shows the golden light from one of the beautiful stained glass windows falling across a statue of the crucified figure of Christ. I thought this scene symbolised redemption and I found it very moving.....particularly the interaction with the shadow where the figure of Christ looks like it is still on the cross. To those who have an unshakeable faith or for those who have lost someone close to them, I can see how places of serenity and beauty like this cathedral might bring a real sense of inner peace".